No. 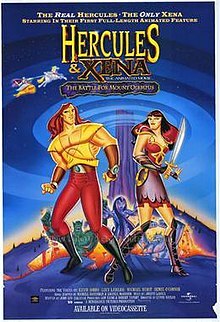 I’m not saying you have to watch this film on a loop to get your Xena fix. I’m suggesting this: reboot Xena as a (hand drawn, thank you very much) cartoon show. What? You think that’s silly? Well that’s why I have a blog and you don’t. Here’s why there should be a Xena animated series. 1. It worked for other franchises. Star Trek has an animated series. Star Wars has five animated series to date. They won awards and are embraced by fans as much as their live-action counterparts. With good scripts and talented artists, a successful Xena animated series is possible. 2. It allows for more creative freedom. 3. No physical demands on the actors. Lucy Lawless is 50. Renee O’Connor is 47. Ted Raimi is 52. Kevin Sorbo is 59 and Michael Hurst is 60. Hudson Leick is 48. I don’t think these actors want to risk hurting themselves doing physical work the show demanded – even with stunt doubles. At the same time, I can’t picture any one else but the aforementioned actors playing their iconic roles, but they can voice the characters they made famous (and it would be fun to see other voice actors guest star on the show. Just imagine Ashley Eckstein or James Arnold Taylor making a guest appearance!). After all if 66 year old Mark Hamill can lend his voice to TESB Luke (and make it work), then Lucy Lawless can do the same. 4. It can tone down the darker aspects of the show. Now I don’t mean turning it into a saccharine kiddy show, but there are certain aspects of the show I wouldn’t be comfortable showing to little girls (“The Ides of March” anyone?). And I want to introduce little girls to Xena and see them embrace her the way they embrace Wonder Woman. But they have shows like DC Superhero Girls to introduce them to kinder and gentler versions of DC’s greatest female characters. There can still be action and adventure in the vein of, say, Justice League Unlimited or Batman: The Brave and the Bold, but without blood or scary moments. Again, with the right kind of writers, it’s possible to make a kid-friendly show that adults will love. Well those are the only reasons I can think of. Any ideas you can add? Let me know in the comments.